Exercise. Now there is a word I love. Exercise Exercise Exercise. Keep it coming. Because exercise is not going away… Or is it? Do we still exercise as much as we use to? Do our children exercise? Do our children exercise often? Do they enjoy exercise? Do you enjoy exercise? Here at advance physio we’ve been remembering the good old days when kids ran around in the streets kicking footballs onto kerbs. Those were the days when you got out of breath because you’d been chasing your friends in a never ending game of hide and seek (no matter what the weather was doing outside!). We use to exercise as children, and as physiotherapists it use to be that you’d see children coming to physiotherapy after a twisted ankle because they’d ran too fast around a corner. Now we look around and see kids standing in circles, heads down, phones out, thumbs at the ready, playing flashing-never-ending-games like flappy bird, and then coming home sitting for hours at a time. No exercise or outdoor activity. Kids just want to be indoors on their computers or ipads. And as physiotherapists that gets us down. Now we see children coming in complaining of a sore neck or sore thumbs rather than getting injuries from exercising outside. As a team of physiotherapists at advance physio we are always reviewing our practice, making sure that we stay at the top of our game – honing out skills and increasing our knowledge and application of the latest research. With the recent news that activity levels in children decrease from the age of 7 years, it got us thinking about what has caused the change in activity and what we can do about it. It’s more and more obvious when you look around that technology is the culprit. Technology now surrounds our children like never before. The problem is that we as a human race haven’t kept up with the impact that technology has had on our bodies. Increased sitting. Increased use of our thumbs. Increased slumping. Increased and prolonged neck bending looking down at phones. Over the last thirty years there has been a relatively quick change on the pressures placed on our muscles and joints, and we have not adapted effectively and collectively as a society in order to cope with these changes. So how can we encourage people to adapt to these new challenges technology places on our bodies? One way to combat this use of technology is to move more. But it’s more than just a few minutes of movements, it’s a lifestyle change. We have to be aware of what we’re doing. How long we’re sitting watching TV. How awkwardly we’re lying in bed looking at our phones. How we manage our sitting while at school or work. As parents and adults we have a duty to educate the next generation about how to keep our bodies healthy for longer. 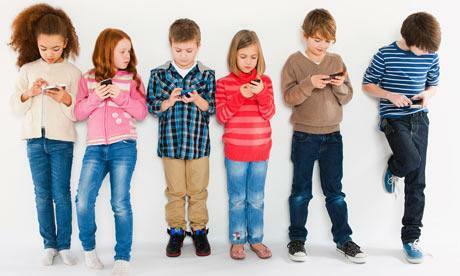 We need to make sure that our future generation knows how to juggle technology while keeping their bodies healthy. They are the ones that embrace new developments and new computer or phone applications. So how can we educate our children about technology and our bodies? Well one way is to encourage children to get active and stay active. So we thought it would be a good idea to share our top ways of helping your children enjoy and stay exercising for longer. Changing habits can be a nightmare, especially with children! But these subtle and not so subtle changes to your day can help children enjoy exercise. The more children enjoy exercise from a a younger age the more they are likely to stay active for longer. Improving physical exercise also increases concentration so it’s a win/ win scenario. More exercise equals homework completed quicker, which equals more time to play. What better way to show your child that exercise is good for you than doing it yourself. Make sure they see you do it, involve them in some way. Be an inspiration. Show commitment. Make sacrifices. Go out of your way to be a role model for them. The hardest thing is if you don’t enjoy exercise too so if that’s the case why don’t you consider taking the leap for your child and go it together. I love this idea – reward your child for being good by playing with them through doing something physical – like going on the trampoline, or even playing hide and seek outside. Show them that getting out of breath can be fun and exciting. Get them involved too and ask them what they want to play outside. What about children who love screen time? The couch potato who loves children’s TV? How do you get them off their seat and moving around? Well here’s a few ideas to get you started: Try limiting screen time. Put phones in the biscuit tin past a certain time of day – this helps them to see your face during important face to face conversations. Be a role model yourself, try narrating your phone use so children know why you are using your phone – “I’m looking up directions to the restaurant”. Also just remember the benefits of physical/ face to face time – it helps decrease the risk of depression and helps improve the well being of our children. So there we go, a few useful tips to help get children up and about. Phones and technology are great but only when used wisely.